The Sleaford Carnival 2014 had a wonderful community spirit as the people of Sleaford turned out to enjoy a fun packed day that was focused at the Boston Road Recreation Ground, but involved much of Sleaford by way of the Bike Race, Fun Run and Carnival Procession. This was the second Sleaford Carnival and in the organisers own words it was a “tremendous success”, that even the moment of a sudden down pour could not spoil. The Carnival started at 9 in the morning with the stalls opening and a dog show in the arena, but then it was the Ray Butler Ltd Criterium Road Race, the first in Sleaford for 30 years, that people rushed to see as the riders, limited to just 50 for safety, set off from near the entrance to the Recreation Ground. The race, through the centre of Sleaford on closed roads, had the riders negotiate a tricky course, including a 180 degree bend, and was overall about 22 miles over the space of an hour, plus then doing five final laps to head back to the finish line near the Recreation Ground. Much of the race was in pleasant weather but then the sky became dark and the last 15 minutes the heavens opened up as a cloudburst made the going rather tricky for the riders, especially on taking the corners. With just about one and a half laps to go David McLean seized his chance and attacked, which was a shrewd move as it gave him a clear victory as he passed over the line in the torrential rain. Second place went to 15-year-old Harry Hardcastle who was racing on reduced gears. Third was Rick Lister. Soon after the Bike Race the Fun Run set off from North Parade, over Galley Hill, along Northgate, East gate to Carre Street, then finished at the Boston Road Recreation Ground. First to finish was Alan Oliver of the Sleaford Striders. Second place was Katja Erävistö and third was a young Harry Denton. After the runners had finished there were the floats and the Carnival Queen. Nightrose Bridals’ Carnival Queen for 2014 was Sara Brown. 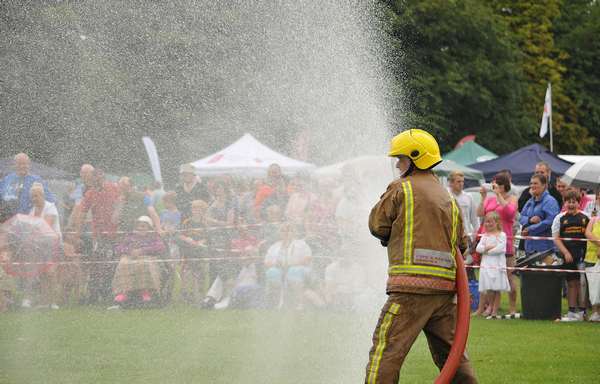 There was much going on in the Arena with dance routines from promising and talented dancers, to an impressive display by the Fire Brigade, which culminated in a hands on experience for the younger members of the public at having a go with the fire hose. Live music, fair rides, stalls and so much more to interest and entertain, a happy fun event that will be looked forward to next year. To see more pictures from the Sleaford Carnival 2014, visit the Album on our Facebook page HERE!